Bangalore: Zee Kannada has been showcasing the best musical talent of the budding superstars in SRGMP Li’l Champs Season 14 for the past four months. 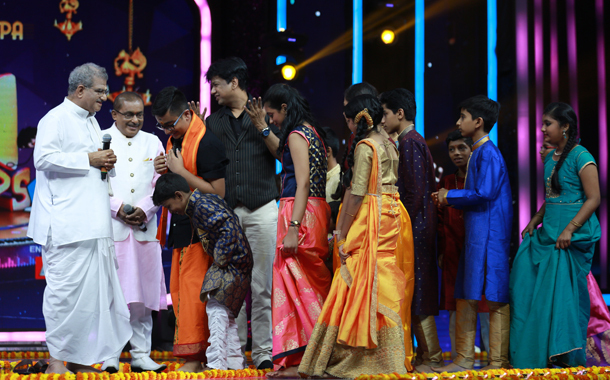 The Channel is set to air the Special episode, in which the young superstars honour Dr. Veerendra Heggade, the highest civilian awardee in Karnataka, with the most revered devotional songs, on April 14 & 15, from 7:30 PM to 9:00 PM. A multi-dimensional individual, Dr. Veerendra Heggade, is a philantrophist, an educationist, a faciltator, a reformer, and Dharmadhikari (head) of Dharmasthala. His unyielding services to the Nation is truly defined by his 48 years of path-breaking contribution to the economic, cultural, and social development of the society. Converting small towns into educational hubs, reviving ancient sciences to further enhance modern lifestyles, are only a handful of his contributions that have resulted in a better today. With an aim to strengthen and motivate our future generation, Dr. Veerendra Heggade was thrilled to spend an entire evening with the young talent pool from Sa Re Ga Ma Pa, for a round of devotional songs.